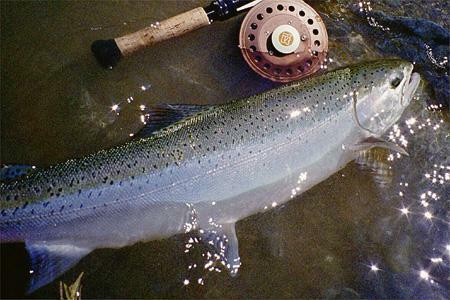 Steelhead is a tasty treaty for any table it happens to grace. Give it a chance and try these enjoyable delectable recipes. Line a baking pan with tin foil and coat it with oil. Pre-heat your broiler on the highest setting. Combine all ingredients except the fish. Blend until it forms a paste. If you kept the skin on, put the fish in the pan skin-side down and evenly spread seasoning mix over the fish meat. Broil for about 5 minutes or less at position 2 in the broiler (2 racks away from the heat). The fish should be JUST seared and the seasoning CANNOT even APPEAR to be burned. Lower fish to 3rd or 4th broiler position and lower the heat to 325°F. Broil for about 10 minutes until the thickest part of the fish is done. Can be served with steamed veggies, rice (white or wild) or your favorite potato. A glass of wine or a nice cold beer is a necessity. 1/4 c. lemon juice. PLEASE use fresh as it is SO much better. In a saucepan, add the butter, lemon juice, mint, lemon zest and garlic. Mix with a wire whisk over a medium-low flame just until butter melts and the tasty elixir is well blended. Pre-heat the grill. Keep it to a medium heat for best results. Brush meat side of the steelhead with the butter elixir ( I like that word. It sounds like I know what I’m doing!). Grill the steelhead with the meat side down ONLY until BEGINNING to brown or approximately about 1 to 2 minutes. Use a large metal turning tool (spatula) and turn fish over. Grill until thoroughly cooked through. Brush with more lemon butter and cook about 2 more minutes. Remove the lovely browned steelhead to plates with the skin side down you don’t want to see that anyways). Boil the rest of the lemon butter elixir and sprinkle over the fish. Sprinkle on the slivered almonds and VOILA! you are ready to eat! We hope you have used and enjoyed our Steelhead recipes. If you have other recipes to share with the world, kindly let us know.